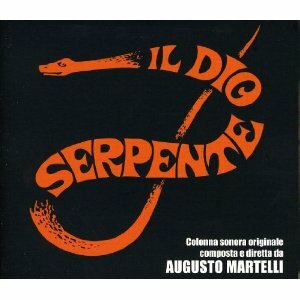 The 222nd Soundtrack of the Week is Augusto Martelli's score for Il dio serpente. This is a groovy soundtrack with lots of flute and percussion. The first track, "Djamballa", begins with a percussion groove. Organ fades in and is joined by overblown flute. A wordless chorus joins the flute, they crescendom bass and drums cone in and go out. There might be a sitar or something else also. It's a bit like "Let It Be". "Beryl's Tune" is an up-tempo funk/rock piece with sitar in the band. Flutes take the melody. "Zombie's Mood" (love that title!) is an eerie and hypnotic piece with wailing worldess singing on top of percussion. After that it's "Drums and Drums", which is like it sounds, though it starts with the sound of blowing into a bottle. "Beryl No. Two" is, unsurprisingly, another version of "Beryl's Tune", this time for organ and percussion. Then there's the Mexian folk music or mariachi tune "Siempre Cantando", presumably source music. "Ciche-Ton-Ton" has a groove that reminded me of gamelan music I've heard. Flutes are on top again, and the melody is nicely lilting. "Equal" begins with percussion, ukulele and someting that sounds at first like synth harmonica but is some kind of acoustic string instrument. Then there's "Il Dio Serpente", a reprise of "Djambala but without the crescendo or instruments other than flute, organ and percussion. A moderate, laid-back groove with lyrical melody played on the flute sums up "Beguine Venezuelana". "Pepito Das Muras" begins with sprightly percussion playing and then goes into a salsa-like groove. "Yamma Yamma" is laid back but not slow and uses hand claps effectively. Flute solos amidst blasts from the sitar. Then a band bursts in with a rock feel and a vocalist ("Yamma Yamma"). I heard a tuba in there and there's some crazy sitar soloing. "Mood" is like a Memphis soul groove for organ, bass, drums and horns with dashes of guitar and piano. It's a bit funky and a bit slinky, a bit like The Meters in the middle and like The Mar-kays on both ends. There's a bit of Herb Alpert's sound in there too. The second half of the record consists of alternate versions of these pieces: three more arrangements of "Il Dio Serpente", three "Drums and Drums", two more "Beryl's Tune", another "Djamballa" and so on.